Every American probably knows about the midnight ride of Paul Revere. But how many Americans know about Paul Revere's actions – or rather, his inaction – during the Penobscot Expedition? I didn't. 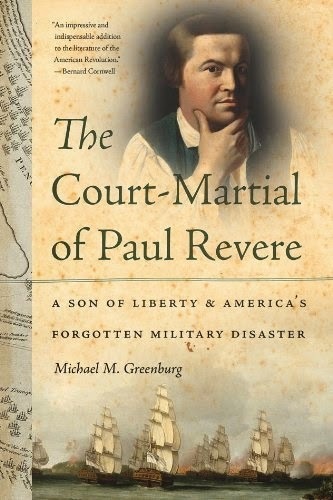 And Michael M. Greenburg's book changed my opinion of Paul Revere. Paul Revere was many things: a patriot, a silversmith, an engraver, and a dentist. But what he was not was a good soldier. Several officers, including Henry Wadsworth Longfellow's grandfather, General Peleg Wadsworth, sought to bring charges up against Paul Revere, the most damning being Revere's refusal to obey orders during the Penobscot Fiasco. I won't tell you about the Penobscot Expedition, what led to Paul Revere's court-martial, or how the court-martial ends. Mr. Greenburg does an excellent job of detailing all of that. You'll just have to read his book to find out.